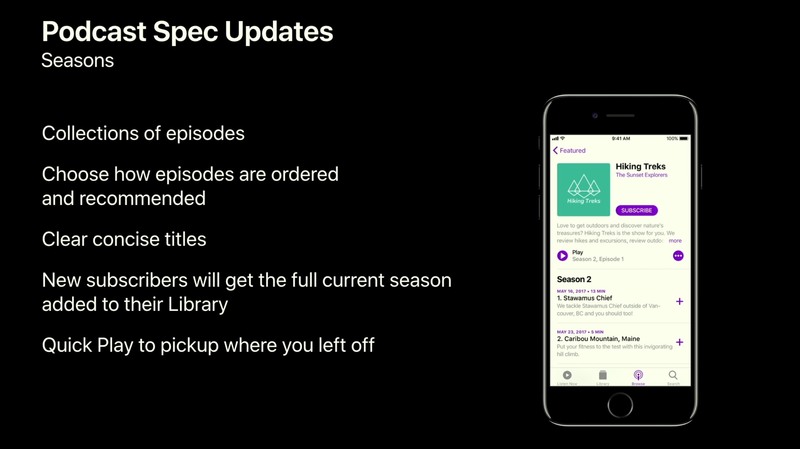 Users will be able to download full seasons, and the Podcasts app will know if a podcast is intended to be listened to in chronological order—“start at the first episode!”—or if it’s more timely, where the most recent episode is the most important. As the world of podcasting has grown, there is now a more diverse selection of shows than ever before, leading to the need for more nuanced formatting of those shows. I appreciate how Apple is implementing these changes at a feed level so that third-party apps can take advantage of them as well. The full array of podcasting changes, including a brief walkthrough of the redesigned Podcasts app in iOS 11, were first covered in a session from WWDC.